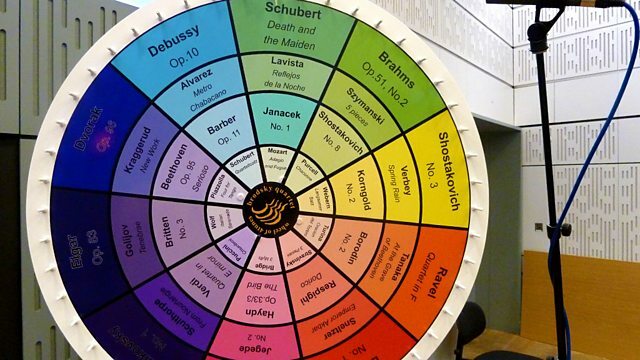 In a concert from Drapers' Hall for the City of London Festival, the Brodsky Quartet invites audience participation in spinning the 'Wheel of 4tunes' to select music to perform. The Brodsky Quartet present an informal concert at Drapers' Hall as part of the City of London Festival, celebrating 40 years since their formation in 1972. The Quartet will invite audience participation in spinning their "Wheel of 4tunes" to determine which piece they play from a selection of 40 works, ranging from Schubert's Quartettsatz to a new work by Henning Kraggerud. The Quartet will then discuss the music and invite questions from the audience, in order to give a sense of their history together and the significance of the chosen works to them. A chance to find out more about this remarkable Quartet and to hear them perform pieces from their eclectic repertoire.